Naturally curly hair is generally quite voluminous by itself. Not mine though, oh no. I have so much hair and it’s so thick and heavy that it weighs itself down so no matter how bouncy my curls might be after a wash, give it a few hours and my entire barnet is looking lank and lacklustre. 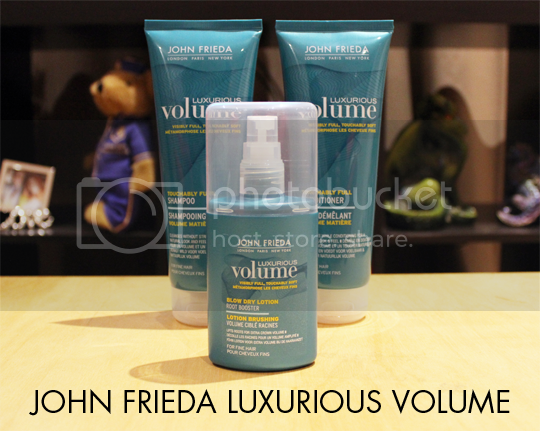 Lately I’ve been trying out a few products from the John Frieda Luxurious Volume range* to see what they can do for me. Starting off with the basics, the Touchably Full Shampoo and Conditioner (£5.99 each). 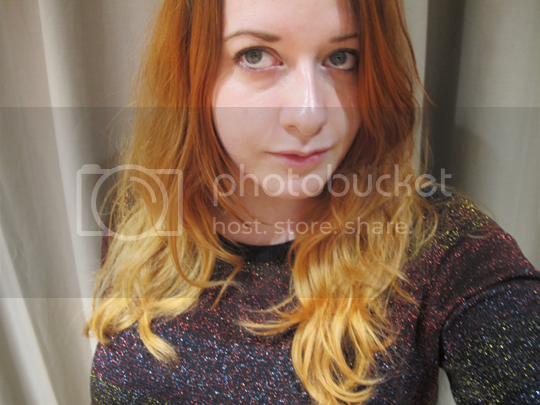 I don’t think my hair could ever be described as ‘touchable’, it’s so bloody frizzy but there you go. I like this duo quite a lot – they have quite a standard salon-y sort of smell (you know what I mean by that, right?) and the shampoo does a good job of making hair squeaky clean without stripping it of oil while the conditioner offers some weightless smoothness. If there’s two things I can’t bear with shampoo and conditioner, it’s a harsh shampoo that dries my hair out and a heavy conditioner that weighs my hair down even more. None of that here, luckily! I have noticed that my hair colour has been fading a little quicker than normal while using these, although it’s only semi-permanent so I can’t really complain. There are versions of this shampoo and conditioner specifically for colour treated hair, so I’d suggest those rather than the standard ones for anyone who dyes their hair. If you’re SLS free with your hair, it’s worth noting that the shampoo does contain SLS so steer clear if this is an ingredient you prefer to avoid. Overall the pair do a good job of cleansing and adding some oomph to the ends of the hair, but there’s no real lift at the roots. Next up, the Root Booster Blow Dry Lotion (£5.99). Now, I don’t usually blow-dry my hair because it turns it into a big frizzy mess so I prefer to leave it to dry naturally. In the name of blogging however, I gave this a go – on a day when I didn’t need to go out just in case! I sprayed liberally all over, paying particular attention to the roots and crown, even flipping my head upside down just to be thorough. Not quite so keen on the scent of this one, it’s in the same ballpark as old-school hairspray with that kind of smell you can taste in the back of your throat. Yeuch. A standard rough blow-dry led to a less curly, more wavy finish than I usually get with my hair and I actually quite liked it. The roots were voluminous too, I had some seriously big hair going on but by the time I got round to taking a photo in the evening it had fallen pretty flat again. To be honest I don’t think that’s the fault of the product, it’s the fault of my stupid heavy hair. I think that someone with hair that’s naturally finer and straighter than mine would probably love these, so if that sounds like you then definitely give them a go. I certainly don’t dislike these products, I just don’t think my hair type allows them to reach their full potential. There are a bunch of other products in the Luxurious Volume range though, so I might check out the styling products and dry shampoo. There’s some pretty cool styling videos on their YouTube channel too, if you need some inspiration. The John Frieda Luxurious Volume range is available at Boots, where you can currently get them on 3 for 2 so if you’re interested, now’s the time!